I could hardly wait to show you my card today. I used the Kissing Ball die from Die-Namites and it cut like a dream. I used Bo Bunny papers for my card background. I love the vintage green color. 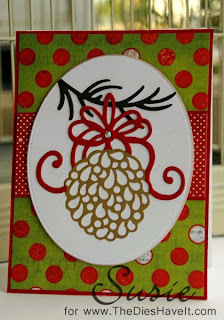 This was such an easy card to make that I decided to add it to my Operation Write Home cards. I am making four more just like it to send. Dies make it so easy to make cards in multiples for charities like this. I hope you will give this technique a try. It is one of my favorites for sure.